I was looking for something lighter and healthier and since both corn and zucchini are in season, plentiful, and on hand I wanted to use both of them. Quinoa salads never fail when light and tasty meals are on the table and I was thinking that a corn and zucchini quinoa salad would be nice. The corn got me to thinking texmex and the next thing I knew it was a corn and zucchini quinoa salad seasoned with taco spices . I feel that spices like this are best when they have had a chance to cook with the dish to release all of their flavours and mingle with the rest of the ingredients. Since this was going to be a mostly fresh salad I decided to add the taco seasoning to the quinoa while it cooked so that the quinoa would be infused with its flavours. I then finished the salad off with some more texmex style ingredients including black beans, green onions, cilantro and some cotija cheese. This quinoa salad was nice and easy to make and it turned out really well. 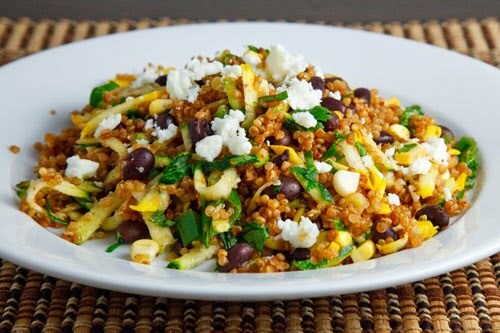 I really liked the way the spicy taco seasoned quinoa worked with the sweet corn and raw zucchini in this salad. The beans added a nice creaminess and the cotija cheese was the perfect finish to this salad. One of the good things about salads like this is that the leftovers are just as good straight from the fridge so they make super quick snacks or light meals. Simmer the quinoa in the water along with the taco seasoning until the water is absorbed, about 20 minutes. Mix the quinoa, corn, zucchini, black beans, jalapeno pepper, green onion and cilantro in a large bowl. Mix the oil, lime juice, salt and pepper in a small bowl. Toss the salad in the dressing and serve garnished with cotija cheese. That looks delicious right now! That looks really good, Kevin. I would even take it one step further and maybe wrap it all up in a tortilla. Looks delicious…I wonder how it would taste with barley instead of quinoa? I have some barley on hand…I'll have to try that! great way to make quinoa – we've got so much good corn this summer…love it! Oh man, that looks so delicious. I think I'm gonna have to try this recipe. your salad have vibrate lovely color combine!! I bet this salad must taste good!! Another fun recipe from you. If I ever have a craving for a taco I can have it in a salad and not feel the slightest guilt and I have no idea why since I love tacos. Beautiful, colorful and surely delicious! This sounds so good. I have a difficult time getting my husband to eat quinoa, but with the taco seasoning I think I just may be able to! Thanks Kevin! Delicious way to flavor vegetables. Looks so good! Your recipes always look amazing!! This one is just out of this world! great salad Kevin! You are so good at combining flavors and using traditional themes in new ways. Sounds fantastic! I do have some zucchini from my CSA to use up, and a bag of quinoa languishing in the pantry… thanks for the idea! I just found your blog today while looking for something that wasn't fried to do with the zucchini. I loved your ideas!! Thanks for sharing. All your recipes look so delicious. Can't wait to try them. I think corn and quinoa are such a great match. Great job here! I made this tonight and my husband and i really loved it. Thanks for posting it. I like that you grilled the corn first. IMO, that brings out the sweetness in the corn. We did that for a maque choux last night and it was awesome! What a fabulous combo of flavors. Love the whole taco idea with the quinoa. Awesome. The more you can do with quinoa the better, I love the stuff. Made this tonight and it was so good! My husband actually had thirds. Couldn't find cotija cheese so used Feta instead. I printed this out months ago when searching for quinoa recipes and FINALLY made it last night for a salad party. It was a huge hit! And I will definitely be making this many more times. I would love to talk about it on my blog, linking to the original recipe here, if that is ok with you? Thank you for such a wonderful fresh-tasting recipe. I used 2 ears of corn and only half a jalapeno because I have an 8, 5 and 2 year old. And they LOVED it! Loved this dish – added chicken and used feta cheese instead, thanks for sharing the recipe!